Madison Grant (November 19, 1865 – May 30, 1937) was an American lawyer, historian, racist and anthropologist, known primarily for his work as a eugenicist and conservationist. As a eugenicist, Grant was responsible for one of the most famous works of scientific racism, and played an active role in crafting strong immigration restriction and anti-miscegenation laws in the United States . As a conservationist, Grant was credited with the saving of many different species of animals, founding many different environmental and philanthropic organizations and developing much of the discipline of wildlife management. Grant was born in New York City , New York , to Gabriel Grant, a well-known physician and American Civil War surgeon, and Caroline Manice. Grant was a lifelong resident of New York City. As a child he attended private schools and traveled Europe and the Middle East with his father. He attended Yale University , graduating early and with honors in 1887. He received a law degree from Columbia Law School, and practiced law after graduation; however, his interests were primarily those of a naturalist. He never married and he had no children. He first achieved a political reputation when he and his brother, De Forest Grant, took part in the electoral campaign of New York mayor William Lafayette Strong in 1894. 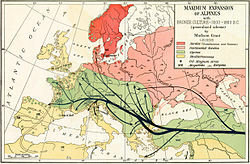 "Maximum Expansion of Alpines" — Map from Passing of the Great Race showing the "essentially peasant" Alpine migrations into Europe. In the book, Grant recommends segregating "unfavorable" races in ghettos by installing civil organizations through the public health system to establish quasi-dictatorships in their particular fields. He states the expansion of non-Nordic race types in the Nordic system of freedom would actually mean a slavery to desires, passions, and base behaviors. In turn, this corruption of society would lead to the subjection of the Nordic community to "inferior" races who would in turn long to be dominated and instructed by "superior" ones utilizing authoritarian powers. The result would be the submergence of the indigenous Nordic races under a corrupt and enfeebled system dominated by inferior races and both in turn would be subjected by a new ruling race class. Nordic theory, in Grant's formulation, was similar to many 19th century racial philosophies which divided the human species into primarily three distinct races: Caucasoids (based in Europe), Negroids (based in Africa), and Mongoloids (based in Asia). 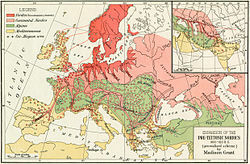 Nordic theory, however, further subdivided Caucasoids into three groups: Nordics (who inhabited Northern Europe and other parts of the continent), Alpines (whose territory included central Europe and parts of Asia), and Mediterraneans (who inhabited Southern Europe, North Africa, and the Middle East). In Grant's view, Nordics probably evolved in a climate which "must have been such as to impose a rigid elimination of defectives through the agency of hard winters and the necessity of industry and foresight in providing the year's food, clothing, and shelter during the short summer. Such demands on energy, if long continued, would produce a strong, virile, and self-contained race which would inevitably overwhelm in battle nations whose weaker elements had not been purged by the conditions of an equally severe environment." The "Proto-Nordic" human, Grant reasoned, probably evolved in eastern Germany, Poland and Russia , before migrating northward to Scandinavia. The Nordic, in his theory, was Homo europaeus, the white man par excellence. "It is everywhere characterized by certain unique specializations, namely, wavy brown or blond hair and blue, gray or light brown eyes, fair skin, high, narrow and straight nose, which are associated with great stature, and a long skull, as well as with abundant head and body hair." Grant categorized the Alpines as being the lowest of the three European races, with the Nordics as the pinnacle of civilization. According to Grant, Nordics were in a dire state in the modern world, where due to their abandonment of cultural values rooted in religious or superstitious proto-racialism, they were close to committing "race suicide" by being miscegenated with and out-bred by more inferior stock who were taking advantage of the transition. The book was immensely popular and went through multiple printings in the United States, and was translated into a number of other languages, notably German in 1925. By 1937 the book had sold 1,600,000 copies in the United States alone. Nordic theory was strongly embraced by the racial hygiene movement in Germany in the early 1920s and 1930s; however, they typically used the term "Aryan" instead of "Nordic", though the principal Nazi ideologist, Alfred Rosenberg, preferred "Aryo-Nordic" or "Nordic-Atlantean". Stephen Jay Gould described The Passing of the Great Race as "The most influential tract of American scientific racism." Grant's work was embraced by proponents of the National Socialist movement in Germany; Passing was the first non-German book ordered to be reprinted by the Nazis when they took power, and Adolf Hitler wrote to Grant that, "The book is my Bible." Grant's work, while a subject of popular discussion in the United States from the 1910s through the 1930s, was often attacked by scientists. who believed it to be little more than racism cobbled together with amateurish approaches to history and anthropology. It is considered one of the most influential and vociferous works of scientific racism and eugenics to come out of the United States. One of his long-time opponents was the anthropologist Franz Boas, whom Grant would reportedly not shake hands with on account of Boas being Jewish. Boas and Grant were involved in a bitter struggle for control over the discipline of anthropology in the United States while they both served (along with others) on the National Research Council Committee on Anthropology after the First World War. Grant represented the "hereditarian" branch of physical anthropology at the time, despite his relatively amateur status, and was staunchly opposed to and by Boas himself (and the latter's students), who advocated cultural anthropology. Boas and his students eventually wrested control of the American Anthropological Association from Grant and his supporters and used as a flagship organization for his brand of anthropology. In response Grant founded the Galton Society with American eugenicist and biologist Charles B. Davenport in 1918 as an alternative to Boas (Spiro 2002). Grant advocated restricted immigration to the United States through limiting immigration from Eastern Europe and Southern Europe, as well as the complete end of immigration from East Asia. He also advocated efforts to purify the American population though selective breeding. He served as the vice president of the Immigration Restriction League from 1922 to his death. Acting as an expert on world racial data, Grant also provided statistics for the Immigration Act of 1924 to set the quotas on immigrants from certain European countries. Even after passing the statute, Grant continued to be irked that even a smattering of non-Nordics were allowed to immigrate to the country each year. He also assisted in the passing and prosecution of several anti-miscegenation laws, notably the Racial Integrity Act of 1924 in the state of Virginia , where he sought to codify his particular version of the "one-drop rule" into law. Though Grant was extremely influential in legislating his view of racial theory, he began to fall out of favor in the United States in the 1930s. The declining interest in his work has been attributed both to the effects of the Great Depression, which resulted in a general backlash against Social Darwinism and related philosophies, as well as the changing dynamics of racial issues in the United States during the interwar period. Rather than subdivide Europe into separate racial groups, the bi-racial (black vs. white) theory of Grant's protege Lothrop Stoddard became more dominant in the aftermath of the Great Migration of African-Americans from Southern States to Northern and Western ones (Guterl 2001). The rise of the Nazis in Germany also contributed to Grant's intellectual falling out of favor, as the similarity of their overtly racist theories to Grant's would become a liability even before they were officially an enemy at war against the United States. Grant was a close friend of several U.S. presidents, including Theodore Roosevelt and Herbert Hoover, and also was an avid conservationist. He is credited with saving many natural species from extinction, and co-founded the Save-the-Redwoods League with Frederick Russell Burnham, John C. Merriam, and Henry Fairfield Osborn in 1918. He is also credited with helping develop the first deer hunting laws in New York state, legislation which spread to other states as well over time. He was also the creator of wildlife management, helped to found the Bronx Zoo , build the Bronx River Parkway, save the American bison as an organizer of the American Bison Society, and helped to create Glacier National Park and Denali National Park . In 1906, as Secretary of the New York Zoological Society, he lobbied to put Ota Benga, a Congolese pygmy, on display alongside apes at the Bronx Zoo . Throughout the 1920s and 1930s, he served on the boards of many eugenic and philanthropic societies, including the board of trustees at the American Museum of Natural History , a director of the American Eugenics Society, vice president of the Immigration Restriction League, a founding member of the Galton Society, and one of the eight members of the International Committee of Eugenics. He was awarded the gold medal of the Society of Arts and Sciences in 1929. In 1931, the world's largest tree (in Dyerville, California) was dedicated to Grant, Merriam, and Osborn by the California State Board of Parks in recognition for their environmental efforts. A species of caribou was named after Grant as well (Rangifer tarandus granti, also known as Grant's Caribou). He was a member of the Boone and Crockett Club (a big game hunting organization) since 1893, where he was friends with president Theodore Roosevelt. He was head of the New York Zoological Society from 1925 until his death. Historian Jonathan Spiro has argued that Grant's interests in conservationism and eugenics were not unrelated: both are hallmarks of the early 20th-century Progressive movement, and both assume the need for various types of stewardship over their charges. In Grant's mind, natural resources needed to be conserved for the Nordic Race, to the exclusion of other races. Grant viewed the Nordic race lovingly as he did any of his endangered species, and considered the modern industrial society as infringing just as much on its existence as it did on the redwoods. Like many eugenicists, Grant saw modern civilization as a violation of "survival of the fittest", whether it manifested itself in the over-logging of the forests, or the survival of the poor via welfare or charity. Grant left no offspring when he died in 1937 of nephritis. Several hundred people attended Grant's funeral , and he was buried in Sleepy Hollow Cemetery in Tarrytown, New York . He left a bequest of $25,000 to the New York Zoological Society to create "The Grant Endowment Fund for the Protection of Wild Life", left $5,000 to the American Museum of Natural History, and left another $5,000 to the Boone and Crockett Club. Passing of the Great Race was said to be Adolf Hitler's favourite book, and even wrote a 'fan letter' to Grant applauding it, stating that the book was "his Bible" At the postwar Nuremberg Trials , Grant's Passing of the Great Race was introduced into evidence by the defense of Karl Brandt, Hitler's personal physician and head of the Nazi euthanasia program, in order to justify the population policies of the Third Reich or at least indicate that they were not ideologically unique to Nazi Germany (it seemed to have had little effect, as Brandt was sentenced to death). Grant's works of "scientific racism" are often cited by scholars to demonstrate that many of the genocidal and eugenic ideas associated with the Third Reich did not arise specifically in Germany, and in fact that many of them had origins in the United States. As such, because of Grant's well-connectedness and influential friends, he is often used to contradict the idea that the U.S. did not have its own history of racism, eugenics, and the popularity of quasi-Fascist ideals. Because of the strong associations his eugenics work had with the policies of Nazi Germany, his work as a conservationist has been somewhat ignored and obscured, as many organizations with which he was once associated do not generally want to overstress their connections with him . In early 2009 the first full and comprehensive biography of Grant was published. It is entitled Defending the Master Race: Conservation, Eugenics, and the Legacy of Madison Grant (Univ. of Vermont Press: ISBN 978-1-58465-715-6) and was written by Jonathan P. Spiro. Grant, Madison. "The vanishing moose, and their extermination in the Adirondacks," Century Magazine 47(1894): 345-356. ________. The caribou. New York, Office of the New York Zoological Society, 1902. ________. "Moose." Report of the Forest, Fish, Game Commission, State of New York (1903): 225-238. ________. The Rocky Mountain goat. New York, Office of the New York Zoological Society, 1905. ________. "Condition of wild life in Alaska," Smithsonian Institution Annual Report, 1909 (Washington, 1910): 521-529. ________. 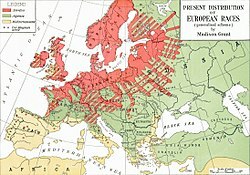 The passing of the great race; or, The racial basis of European history. New York, Charles Scribner's Sons, 1916. ________. The passing of the great race, or, The racial basis of European history. New edn., rev. and amplified, with a new preface by Henry Fairfield Osborn. New York, Charles Scribner's Sons, 1918. ________. Saving the redwoods; an account of the movement during 1919 to preserve the redwoods of California. New York, Zoological Society, 1919. ________. The passing of the great race, or, The racial basis of European history. rev. ed. with a documentary supplement, with prefaces by Henry Fairfield Osborn. New York, Charles Scribner's Sons, 1921. ________. Der Untergang der grossen Rasse, die Rassen als Grundlage der Geschichte Europas. German translation of The passing of the Great Race by Rudolf Polland. München, J. F. Lehmann, 1925. ________, ed., with Charles Stewart Davidson. The founders of the republic on immigration, naturalization and aliens, collected for and edited by Madison Grant and Charles Stewart Davidson. New York, C. Scribner’s Sons, 1928. ________, ed., with Charles Stewart Davidson/ The alien in our midst; or, "Selling our birthright for a mess of pottage"; the written views of a number of Americans (present and former) on immigration and its results. New York, The Galton Publishing co., 1930. ________. The conquest of a continent; or, The expansion of races in America. New York, Charles Scribner’s Sons, 1933. "Madison Grant, 71, Zoologist, Is Dead," New York Times (31 May 1937), p. 15. Barkan, Elazar. The Retreat of Scientific Racism: Changing Concepts of Race in Britain and the United States between the World Wars (Cambridge, UK: Cambridge University Press, 1992). Cooke, Kathy J. "Grant, Madison." American National Biography. Online, Feb. 2000. Spiro, Jonathan P. "Patrician racist: The evolution of Madison Grant." Ph.D. diss., Dept. of History, University of California, Berkeley (2000). ________. "Nordic vs. anti-Nordic: the Galton Society and the American Anthropological Association," Patterns of Prejudice 36:1 (2002): 35-48. ________. "The Alien in Our Midst." Regal, Brian. Henry Fairfield Osborn: Race and the Search for the Origins of Man (Ashgate, 2002).Regal, Brian. "Maxwell Perkins and Madison Grant: Eugenics Publishing at Scribners," Princeton University Library Chronicle LXV:2 (Winter 2004):317-341. Spiro, J. P. (2008). Defending the Master Race: Conservation, Eugenics, and the Legacy of Madison Grant. Lebanon, NH: University Press of New England, p. 357.